The Cleveland Cavaliers and Golden State Warriors are back at it for a rematch in The NBA Finals this season. This year’s series has a plethora of storylines and matchups to make for an exciting series. Golden State’s record 73 wins this season means nothing without a championship. The ’95-’96 Chicago Bulls team that won 72 games throughout the regular year cashed that in with a championship, which Golden State will need to do in order to make their case for best team in league history. That Chicago team also won a total of 87 games including the postseason that year. Should Golden State win this series they will have won 89 games including the playoffs this season and a total of 172 over the past two years. A lot is on the line as far as team greatness for the Warriors in this series. On the other hand there is LeBron James, now in his sixth straight Finals. LeBron has won two rings already but has lost in four Finals series in his career. Along with the fact that the city of Cleveland has not won a Championship in ANY of the four major sports since 1964, a lot of pressure is on LeBron James as well. As far as matchups in this series, Golden State has the clear and most widening advantage at the guard positions. Klay Thompson and Steph Curry have found their grove again from that 3-1 comeback against Oklahoma City, and expect them to keep that pace up. While Cleveland does have Kyrie Irving who has been shining this postseason, he is going up against the unanimous MVP who just dispatched All-NBA Team performers Damian Lillard and Russell Westbrook in the past two series. Klay Thompson has the advantage against any of the shooting guards for Cleveland. LeBron James and Kevin Love give Cleveland a formidable duo at the forward positions, but Draymond Green will be a good counter to Kevin Love. 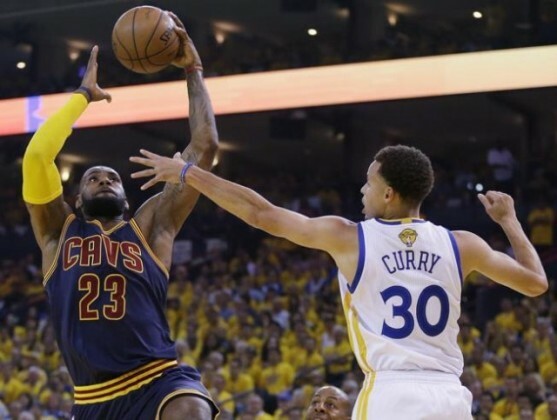 Harrison Barnes and Andre Iguodala will draw the assignments on LeBron James for most of the series, look for Green to be marking up James at certain key moments as well. Andrew Bogut will have to stay on the court and be injury free for Golden State in this series. Tristan Thompson, the center for Cleveland is a monster on the offensive glass, and the Warriors will have their hands full with Thompson even when Bogut is playing so a limited Bogut bodes very well for Cleveland. While neither bench is spectacular, Golden State’s is a bit better. Iguodala is an experienced veteran off the Warriors bench, and Festus Ezili and Marreese Speights can stretch the floor for big men. Iman Shumpert and Matthew Dellavedova off the bench for Cleveland will need to be the solid defensively against both Steph Curry and Klay Thompson, and Channing Frye will need to be hitting his shots. For Cleveland to win, LeBron James will have to be the best player on the court and assert himself early in games offensively, than let the rest of the game come to his teammates – not the other way around. James too often likes to get everyone involved and then let the game come to him. In this series, LeBron has to be aggressive for Cleveland to win. The matchups are too much in favor of Golden State, and I don’t see LeBron being aggressive enough. While the matchups are fairly even everywhere else, the difference in the guard play is too much in Golden State’s favor for Cleveland to win this series. Sorry Cleveland, it will be 52 years and counting since Championships after this series, WARRIORS IN SIX.